ALBINUS (AUBIN) of ANGERS, A pious child of a noble Gallo-Roman family, who in his mid-twenties received monastic tonsure at Tincillac Abbey, later serving as its abbot for a quarter century. St. Albinus was consecrated Bishop of Angers circa 529, serving until his repose circa 549. 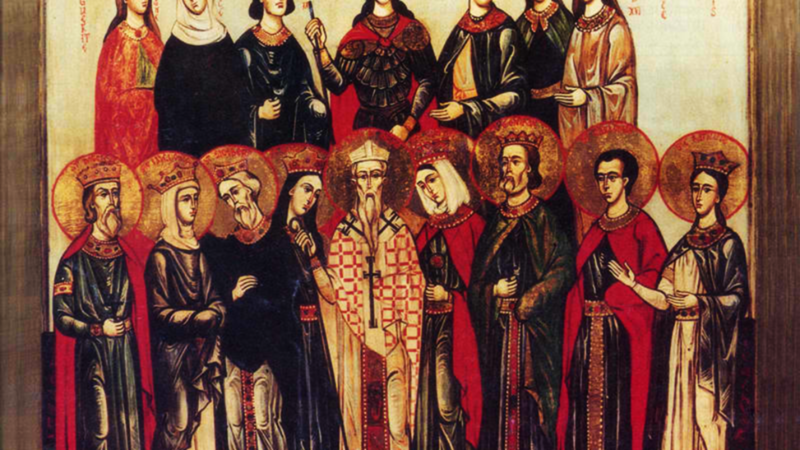 Having condemned consanguineous marriage, St. Albinus participated in the third Council of Orleans in May 538, at which impediments to marriage were settled. DAVID, our father among the saints David of Wales, known in Welsh as Dewi Sant, is the patron saint of Wales and considered by many to be one of the most illustrious of the ancient British bishops. He is also known as the Dewi Ddyfrwr (David the Water Drinker) due to his habit of drinking only water and the creation of many holy wells associated with his life. Though there is no reliable Life extant, legend has it that St. David was born to noble parents in South Wales and educated by St. Paulinus (23rd November), the disciple of St. Germanus of Auxerre (31st July). He was a staunch opponent of the Pelagian heresy, and the founder of the See of St. David’s or Menevia. To which, when appointed to succeed St. Dubricius (14th November), he transferred the primary Welsh Bishopric from Caerleon. The foundation of a dozen monasteries and many miracles are attributed to St. David, and he is said to have been zealous in encouraging discipline among both clergy and laity, and to have presided over the Synod of Brefi circa 560. The date of his repose is listed as anywhere from the mid-sixth century to circa 601. His relics survive and are enshrined in St. David’s Cathedral, St. Davids, Pembrokeshire, Wales. HERMES, ADRIAN, and COMPANIONS, several Christians in Numidia (in present-day Algeria) martyred circa 290 during the reign of Emperor Maximian (r. 286–305). LEO of ROUEN, a Bishop of Rouen, he retired from his See to evangelise in Navarre, and the Basque provinces. St. Leo was martyred by Saracens near Bayonne in 900. Legend says after his beheading, St. Leo picked up his head and walked with it to where he had last preached. LEOLUCAS (LEO LUKE), abbot of a monastery in Corleone in Sicily, who is also venerated in Calabria where he had been a member of a monastic community. St. Leolucas reposed in the early tenth century, reputedly at the age of one hundred. 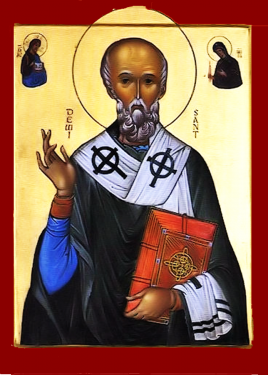 LUPERCUS (LUPERCULUS), possibly a bishop, most sources state St. Lupercus was martyred circa 300, though Church of England priest, hagiographer, and all round scholar Sabine Baring Baring-Gould (†1924) places his martyrdom during the Decian Persecution (250). His veneration was centred in the Armagnac region, St. Lupercus was also venerated at Tarbes in the Hautes-Pyrénées region. MARNOCK (MARNANUS, MARNAN, MARNOC), a native of Ireland, St. Marnock spent time at Iona with St. Columba (9th June), and later served as a bishop, though the name of the See is lost to time. He reposed in Annandale in Scotland circa 625, and was much venerated on the Scottish border. Kilmarnock in Scotland is named for him. Abundantius, Adrastus, Agapius, Charisius, Donatilla, Donatus, Fortunus, Leo, Nicephorus, and Polocronius. MARTYRS of ROME, a group of two hundred and sixty Christians sentenced to road work on the Salarian Way in Rome. In 269, they were no longer of use to the Romans and were publicly martyred in the amphitheatre. MONAN, St. Monan began as a disciple of St. Adrian (4th March) at St. Andrews in Scotland, and later was a missionary along the Firth of Forth. Along with six thousand other Christians, he was slain by the Danes in 874. His relics were held in great veneration at Innerny (present-day St. Monans) in Fife, the place of his martyrdom, and were famous for miracles. RUDESIND (ROSENDO), a son of Count Gutierre Menéndez in Galicia in present-day Spain, St. Rudesind was consecrated Bishop of Mondoñedo, it is said at the age of eighteen, and later was translated to Compostella. He successfully helped to defend the region from both the Vikings and Moors. A plot lead by a corrupt cousin led him to resign his See, and St. Rudesind spent the rest of his life founding monasteries and serving as abbot. He reposed in 977. SIVIARD, a monk at Saint-Calais Abbey on the River Anisola (now called the Aniole) near Le Mans, where his father was Abbot. St. Siviard was the author of a life of St. Calais (1st July), the Abbey’s founder, and succeeded his father as Abbot. St. Siviard reposed circa 729. SWITHBERT, one of the twelve monks who accompanied St. Willibrord (7th November) to Friesland in 690. Following three fruitful years of evangelism, St. Swithbert was consecrated a missionary bishop at Ripon in 693. He returned to evangelise along the Rhine in the area of present-day Düsseldorf. St. Swithbert also founded a monastery on the island of Werth in the Rhine which later became the Kaiserswerth district of Düsseldorf. St. Swithbert spent the final years of his life at this monastery and reposed in 713.